A very interesting info-graphic about the Fourth of July. How Do People Celebrate July 4th This Year? Cookout, barbecue or picnic was the celebration of choice for 62.6 percent in 2009 and 61.9 percent in 2010. Fireworks or a community celebration was attended by 42.7 percent in 2009 and 42.4 percent in 2010. In 2009, 11.5 percent attended a parade, with 12.2 percent doing so in 2010. Travel or a vacation was chosen by 11.4 percent in 2009 and 11.7 percent in 2010. Other celebrations involved 11.7 percent in 2009 and 11.2 percent in 2010. In 2009, 12.8 did not celebrate, with 12.2 percent not celebrating in 2010. Ever wonder how dads today stack up to their counterparts of past generations? Here’s statistical proof the modern father is upping his parenting game—and yet something is amiss. Despite putting in record number of hours with the kids, modern day dads aren’t feeling the love. Comic superheroes have been an inspiration to the world. They have inspired technological advancements which help saves lives and enhanced scientific research and produced gadgets for the real human. Superheroes have even helped humans to develop themselves further through Parkour training. This infographic will show you the scientific and educational skills required in developing this enhanced technology and it will also show you how the power of technology has helped those with disabilities. Do you want to know the future of real superhero powered technology? Then get to know the work of The Virtual Human Interaction Lab in this infographic. 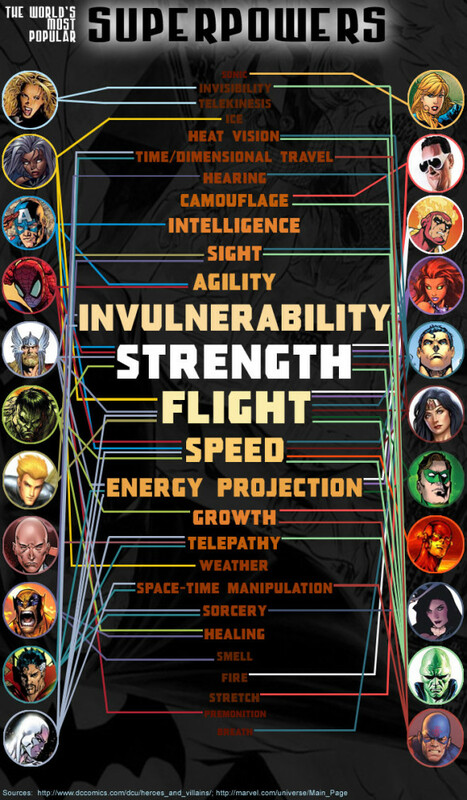 Since the 1950s, comic book heroes have awed us with their otherworldly abilities. Different iconic superheros have brought new and exciting powers to the table and many have multiple powers and attributes that further their crime-stopping, life-saving agendas. Can you name all the special powers we have seen in popular culture? Here is a complete list of superpowers and the heroes who can put them on their resumes. Ever slept with the light on? You’d be surprised at the number of people who do. This is because there’s just something inherent in human beings that tends to make many of us fear darkness. OnlineClock.net’s infographic explores this topic, and attempts to answer the questions of why human beings are often afraid of the dark, and whether these fears are at all justified, plus offering suggestions regarding what we can do to allay these fears! Afraid Of The Dark? infographic by ernestoolivares. Con un tema común para todos los seres humanos, para que practiquen sus habilidades de lectura, aquí les compartimos un gráfico sobre el uso del papel de baño con datos muy interesantes.